Absolut Electrik, the latest limited edition bottle design by Absolut vodka, has launched into travel retail with activations in key airports across the globe. The limited edition is a range of metallic bottles – available in blue and silver – designed to “evoke a feeling of energy capable of turning any night electric”. 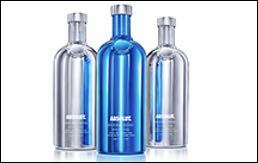 To celebrate the launch of Absolut Electrik into travel retail (US$21.00), Absolut has been engaging travellers at destinations across the globe with promotional activity. From September to December, key airports across Asia and Pacific have hosted Absolut Electrik themed bars offering travellers a taste of the Absolut Electrik Blue Mule cocktail. In Europe, an Absolut Electrik bar offering tastings of this new cocktail will open at London Heathrow Terminal 3 until January 5, 2016. During this time at London Heathrow, travellers will be offered exclusive gifts with purchase of Absolut Electrik leather luggage tags in Electrik blue and silver.